Check out the latest TJX Companies earnings call transcript. 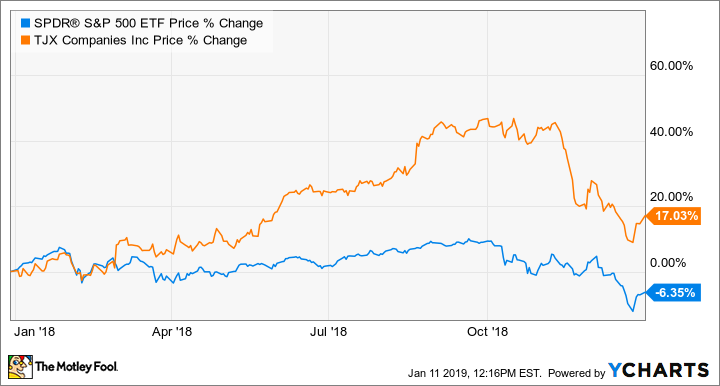 After underperforming in 2017, shares of TJX Companies (NYSE:TJX) took off in 2018, spurred by solid operating results. The stock was up over 40% through September but gave back some of those gains amid the market turmoil in the last few months of the year. TJX shares finished the year up 17%, according to data provided by S&P Global Market Intelligence, significantly outperforming the S&P 500's loss of 6.35%. TJX's off-price business model has proven to work well in both good times and bad. Over the last three years, when many analysts were talking about the so-called "retail apocalypse," TJX continued to report growth in its comparable store sales. With the economy picking up steam over the last year, TJX sales growth accelerated to as high as 7% in the fiscal third quarter (which ended Nov. 3). That's much better than the flattish growth in comp sales the company reported in the year-ago quarter. For the first nine months of fiscal 2019, TJX grew sales 11.8% year over year to $27.8 billion. The growth on the top line and a lower tax rate led to growth in earnings per share of 31.6% year over year. During the fiscal third-quarter conference call, CEO Ernie Herrman said, "This marked the 17th consecutive quarter that customer traffic was up at TJX and Marmaxx. Further, we saw continued momentum in our apparel businesses across the company." Based on the strong results through the third quarter, management raised its outlook for the year. The company expects earnings per share -- adjusted for the 2017 tax cut benefit and other one-time items -- to grow 8% over fiscal 2018. It expects that growth to be driven by comp sales growth of 5%. However, management said that incremental freight costs and wage increases will trim about 5% off earnings growth. We believe our strong third quarter results demonstrate the fundamental strength of our off-price treasure hunt. Staying focused on offering consumers great merchandise and great values continues to be our winning formula. We are convinced that we are continuing to gain market share in the U.S., Canada, Europe, and Australia, which is great for our future.